When you noticed that your little one has taken his first step, that may feel prompted to get something that will make the walking process easier for him. There are many ways through which you can achieve this, but the most popular ones are the Sit-To-Stand and the seated baby walkers. You are probably reading this page because you are looking to buy the best walker for your little one. If this is correct, then you are in the right place. There are many models of baby walker from different brands on the market. The swelling number of products may make it difficult for you to make the best choice within a short period of time. We are aware of this and that is why we have dedicated our time and resources into providing you with a list the best baby walker on the market. This post will furnish you with a detailed information about each product as well as other important information about baby walkers. We believe that the information provides in this post will go a long way to help you make an informed decision. Read on for more information. There are two types of baby walkers in the market. You can choose between a seated walker or a sit to stand walker. The difference in the two, as you guessed is one has the child in a seat while the other requires the child to be standing. There are pros and cons to both, but ultimately, it’s up to what best suits you and your child as well as other activity centers you’ve bought for your child for example if you have a stationary play center a standing walker adds to a child entertainment. Babies generally start to take their first baby steps between the ages of 12 and 15 months. A walker helps them by maintaining balance, stability and providing assistance while they begin to explore their surroundings in a new way younger. The benefits of having a seated walker are having a place to play and eat, as almost all seated walkers come with a tray. Depending on the model and make, they also come with neat entertainment features. Sit-To-Stand walkers are cheaper, they have entertainment features on the front that kids love to play with. No matter which type of walker you buy, parental supervision is required. Unfortunately, baby walkers are known to be a safety concern. Parents just don’t realize how fast and far a baby can move once they start to get a hang of using a walker. This leads to kids falling down stairs, pools and into furniture. It’s vital that you never leave your baby unsupervised and around unsafe things, this includes hazardous items that a baby with a walker can easily reach. 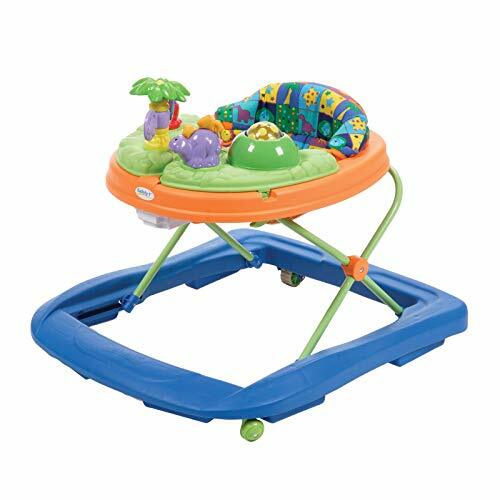 The Safety 1st Sounds ‘n Lights Discovery Walker is one of the most popular and best baby walker on the market. This product has received favorable reviews from pass users which is a plus. This product features a beautiful modern design that you and your little one will find appealing. Also, it is available in a multicolored shade that will go a long way in adding color to your nursery. The product is ideal for infants since it comes with a minimum weight recommendation of about 19.84 Pounds and a maximum recommendation of 30.9 Pounds. If your little one is fond of animals, he will find this product fascinating since it features a dinosaur theme. Moving the walker from place to place will not be a problem since it is lightweight. It weighs only about 11.02 pounds. Storage will also be relatively easy as the product can be folded for easy storage at home or when going on a trip. It has a dimension of about 24 x 28.1 x 22.5 inches. The product is made from top quality plastic and fabric that will allow your little one to enjoy all the benefits it has to offer for a long period of time. Furthermore, you will probably not have a reason to worry about your little one’s safety with this product since it comes with a safety features that are wide and stable base that will support his/her weight while providing sufficient space for comfort. The Safety 1st Sounds ‘n Lights Discovery Walker is also adjustable thus making it easy to tweak the product to perfectly fit your little one as he grows. It features 3 adjustable heights. Also, the product comes with five playful dinosaurs themed toys that crackle, spin, rattle, and even light up. All these are accompanied by 12 different songs which play as your little one spends time with the toys. These songs and the toys will contribute immensely to the development of your baby. The product is easy to assemble. In addition, maintenance will be pretty easy as the walker comes with a machine washable padded seat. The plastic components of the product can be easily wiped with a wet towel. The Safety 1st Sounds ‘n Lights Discovery Walker is paired with sturdy wheels that allow your little one to move around as much as he wants. The good thing about the wheels is that they work perfectly both on carpets and on the floor. You don’t have to worry about your little one bumping into things as the walker comes with a built-in grip strips that help to slow his movement down on uneven surfaces. The manufacturer did not forget about your baby’s mealtime. The product features an easy to clean tray just beneath the toys. This walker features a budget-friendly price and it ships with a one-year warranty to further assure you of its quality. Also, the manufacturers state that the product meets and even exceed federal safety standards. However, for the product to work properly, you will need to buy batteries separately since the product does not ship with it. Our second best baby walker, the Baby Einstein Baby Neptune Walker is another amazing product and top walker on the market. It features a luxurious designed that is guaranteed to provide your little one with all the comfort he may desire from a walker. The product is available in 3 different themes – neighborhood symphony, blue and ocean explorer all of which will blend seamlessly with your home decor. The product is ideal for infants that are between the age of 6 months and 1 year. This is primarily because the minimum weight recommendation is 0 pounds and the maximum weight recommendation is 26 pounds. With a weight of about 12.2 pounds, one may safely conclude that this best walker product can be easily moved from place to place. Also, storage will be relatively easy since the Baby Einstein Baby Neptune Walker has a dimension of 23.5 x 6.8 x 18.2 inches. It is made from a sturdy and durable plastic that will allow your little one to go anywhere and safely bump into things. Buying this product is an investment since the durable material will allow your little one to enjoy it for a long time or even for use with subsequent babies. 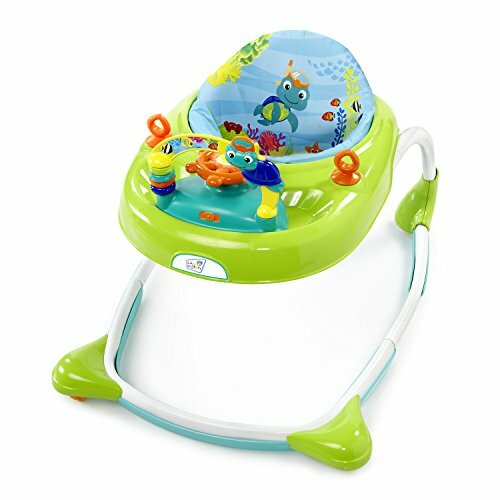 The Baby Einstein Baby Neptune activity walker features a toy station complete with light and sounds. It’s simple and basic thereby making ideal for your little one. However, the toys and music vary based on the theme you decide to go for. Its wheels are smaller and are designed only to move forward and backward. The elliptical frame of the product goes a long way to provide your little one with balance and additional safety. The height can be easily adjusted as your little one grows. In addition, the high seat provides a back support for your little one. 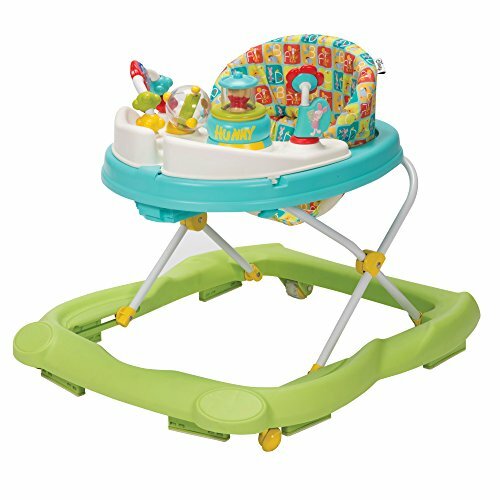 Looking at the featured toys, this baby activity walker product may also serve as an activity center for your little one. The steering wheel functions to activate the lights and sounds as your baby plays with it. Furthermore, the nautical toy station is designed in a way that allows it to be removable for easy play on the floor. Assembly is easy and the process may only take a few minutes to complete. Maintenance will also be easy since all you need to do is wipe the frames with a wet rag. The seat pads are machine washable. 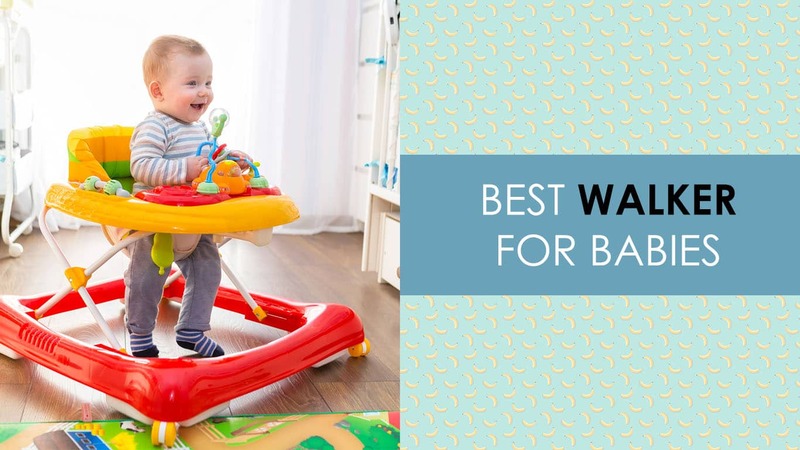 However, unlike many products on the market that ships with wheels that spin, that of the Baby Einstein Baby Neptune Walker is designed to move forward and backward which may limit your little one’s ability to explore places. Also, the walker is designed for kids that are aged 5 to months, but most kids do not take their first steps until after 12 months. Some users have complained that the product is pricey compared to similar products on the market. It may also not be entirely safe since the product has a tendency to flip with bigger kids. Also, for the product to work properly, you will need to buy 2 AA batteries separately since the product does not ship with it. The Disney Winnie The Pooh Music and Lights Walker is a popular product on the market. It has received favorable ratings from past buyers which is probably due to the features the product packs for your little one. It sports a stylish modern design with multicolor shades that will leave your little one fascinated while also allowing him to learn the difference between many different colors. This product is designed to cater to the needs of babies that are age 4 months and more with a maximum weight recommendation of 30 pounds. It is especially ideal if your little one is a fan of Winnie the Pooh as the products come with a theme of the cartoon character. The baby walker is made from top quality and durable plastic and fabric that will allow your little one to enjoy the product for a long time or even for use with multiple babies. The product is lightweight and portable which invariably means moving it from place to place will not be a difficult task. The Disney Winnie The Pooh Music and Lights Walker weigh only 11.6 pounds. Also, storage will probably not pose any issue as the product has a dimension of about 29 x 25 x 5 inches. This is in addition to the fact that it is foldable for easy transportation and storage. If you are looking to buy a product that provides your little one with all the comfort he may desire, then you should consider looking at this one. It features padded seat, a high chair with a padded backrest that will perfectly support your little one if he leans backward. The Disney Winnie The Pooh Music and Lights Walker also features 3 height position height adjustment that will allow you to tweak the product to perfectly fit your little one as he grows. Disney baby walker features 12 Winnie the Pooh songs and 4 toys that are designed to provide your baby with all the fun he could probably get from a walker. It features a large easy to wash play tray that can be easily revealed when it’s lunchtime. This walker works on carpets and has a machine washable padded seat. The tray locks in different positions, easy to set up and it is sturdy. Furthermore, the Disney Winnie The Pooh Music and Lights Walker feature a sturdy wheel that allows your little one to move from place to place with ease. The wheels are designed to run perfectly both on the floor and on carpets. You will probably find that maintenance is a breeze with this product as the plastic components can be easily cleaned with a wet towel. The padded seats also support machine wash. Many users like that the product has a reasonable price tag. However, for the product to work properly, you will need to buy batteries separately since the product does not ship with it. 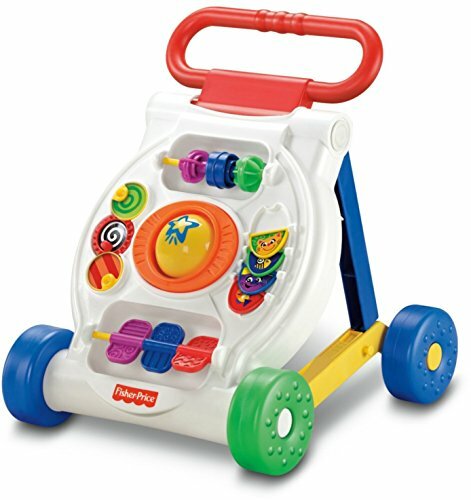 This is another good baby walker manufactured by a reputable company. If you are familiar with buying babies’ accessories, you will agree with me when I say Storkcraft has a track record for manufacturing top quality baby accessories, and the Storkcraft Mini-Speedster Activity Walker is not an exception. This product features a stylish and luxurious design that will provide your little one with all the fun and comfort he may desire. It is available in four different colors – black, blue, red, and pink thus giving you an option to go for the one that works best for you. The product is designed to cater to the needs of male and female babies. In addition, it is specially designed for babies that weigh up to 26 pounds. 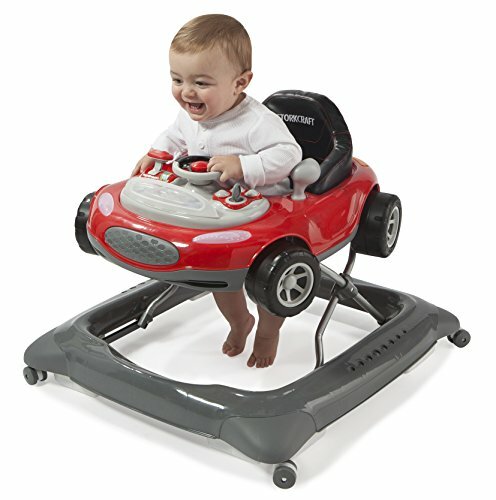 Interestingly, the product comes with a car theme which makes it ideal if your little one is fond of vehicles. The Storkcraft Mini-Speedster Activity Walker is lightweight and portable since it weighs only about 13.4 pounds. This invariably means the product can be easily moved from one place to another. Storage will also be relatively easy since the product is foldable and it has a dimension of about 14 x 27 x 25 inches. The fact that it is foldable makes it easy to fit into your vehicle when going on a vacation. The Storkcraft Mini-Speedster Activity Walker features a steering wheel that lights up and makes real car sounds as your little one plays with it. It also features a removable, adjustable and easy to wash toy tray that may be useful during mealtime. This will go a long way to give you the feeling that your baby is in a bumper car. It will also provide your little one with an unforgettable experience while stimulating learning and allowing for a rapid mental development. The baby walker comes with a three-position height adjustable that will allow you to tweak the product to serve the needs of your growing baby. The main selling point is the car theme, and with the steering wheel and dash being removable is perfect for playing with on the floor. The walker does have swiveling wheels allowing for full rotation thus allow your little one to easily explore different locations. Furthermore, the padded seat and the padded high chair backrest may be beneficial in providing support for your little one when he leans backward. Maintenance will also be easy with the Storkcraft Mini-Speedster Activity Walker as the product comes with a detachable seat pad that supports machine wash. The plastic frame can be cleaned by simply wiping with a wet rag. However, for the product to work properly, you will need to buy 2 AA batteries separately since the product does not ship with it. Some users have complained that the wheels of the product do not work well on carpets. Other states that the Storkcraft Mini-Speedster Activity Walker is of a low quality. The product is too expensive compared to similar walkers on the market. The Fisher-Price Bright Beginnings Activity Walker is one of the best sit to stand walkers on the market. The product is designed to provide your little one with top performance for a reasonable period of time. It features a sturdy and modern design that will go a long way to add class and style to your little one’s nursery. Also, it comes in a beautiful multicolored appearance that your little one will find fascinating. This interactive walker is designed to cater to the needs of babies that are aged 9 months up to three years like entertainment and developmental. It is ideal for even babies that are yet to take their first step since the product folds flat for easy use by sitting babies. As your baby grows and takes his first step the product can also be reverted back to a sturdy walker. It is lightweight and portable with a weight of just one pound. The fact it folds coupled with its dimension of 19 x 6.5 x 14 inches says the product can be easily stored even by those who have limited space. 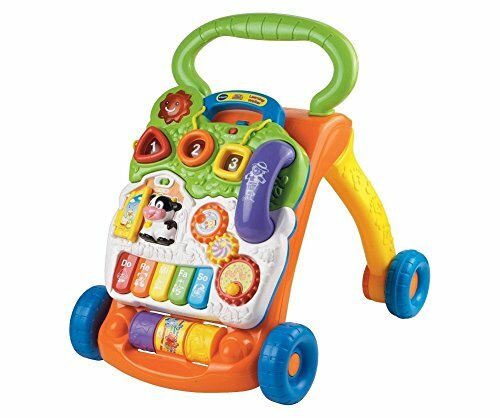 The Fisher-Price Bright Beginnings Activity Walker can also serve as an activity center as it comes with sliding beads, spinning panels, flipping doors, and turning gears that your little one will learn new things from on a daily basis. However, for the product to work properly, you will need to buy 3 AA batteries separately since the product does not ship with it. Some parents complained about its quality and sturdiness. Others state that is too pricey compared to similar products on the market. If you are looking for a top quality product for a budget-friendly price then you should consider looking at the VTech Sit-to-Stand Learning Walker. The product features an ergonomic multicolored design that will excite your little one and provide him with all the fun he may desire. It is available in six different color combination thereby giving you a choice to go for the one that works best for you. The baby walker is designed to cater to the needs of babies that are aged 9 months up to 3 years. With a weight of only 5 pounds, this product may be easily moved from place to place. Storage may also be easy since the product has a dimension of 16.5 x 14.2 x 18.1 inches. It is important to state that the VTech Sit-to-Stand Learning Walker will contribute immensely to the development of your child as it features a learning center that has 5 piano keys which play amazing music as your little one plays with it. The product comes with more than 70 music, sing-along songs, fun phrases, and sound effects. Furthermore, the VTech Sit-to-Stand Learning Walker comes with a removable panel for your little one to play on the floor thereby making it ideal for sitting babies. It also has sturdy wheels that work well both on the floor and on carpets. The walker features 3 shape sorters, 3 light-up buttons that have motor skills, and 2 spinning rollers, a toy telephone and mechanical elements that allows your little one to have fun. However, for the product to work properly, you will need to buy 2 AA batteries separately since the product does not ship with it. This is another amazing sit to stand walker on the market. It is made from top quality and durable material that will allow your little one to enjoy the product for a long time. It is designed to cater to the needs of both male and female babies that are aged 6 months to 4 years. It is lightweight and portable. With a weight of about 2.2 pounds, one may safely conclude that it will be easy to move this product from one place to another. Storage will also be easy since the product has a dimension of 26.9 x 3.5 x 16 inches. The Fisher-Price created a simple walker that teaches when the baby interacts with it. It plays the 123’s and the ABC’s. The Fisher-Price Learn with Me Zebra Walker plays songs and phrases and for the price, is worth it. It would have been nice if they added brakes as it does roll away when the little ones are interacting with the entertainment center. The product is inexpensive and you can purchase it for less than $20. However, for the Fisher-Price Learn with Me Zebra Walker to work properly, you will need to buy 2 AA batteries separately since the product does not ship with it. Some parent complains that the flipping plastic pieces are a major set back for the product since babies can easily hurt themselves by placing their fingers in between. Others state that the product may not be entirely safe as the wheels cannot be locked to make the product immobile.